Sprouted bread is made with whole grains, such as wheat, rye, spelt and millet. The sprouts are used to form a loaf. The loaf is oven baked, and then ready to eat. The downside is that sprouted unleavened bread doesn’t lend itself well to sandwich making because of its texture. 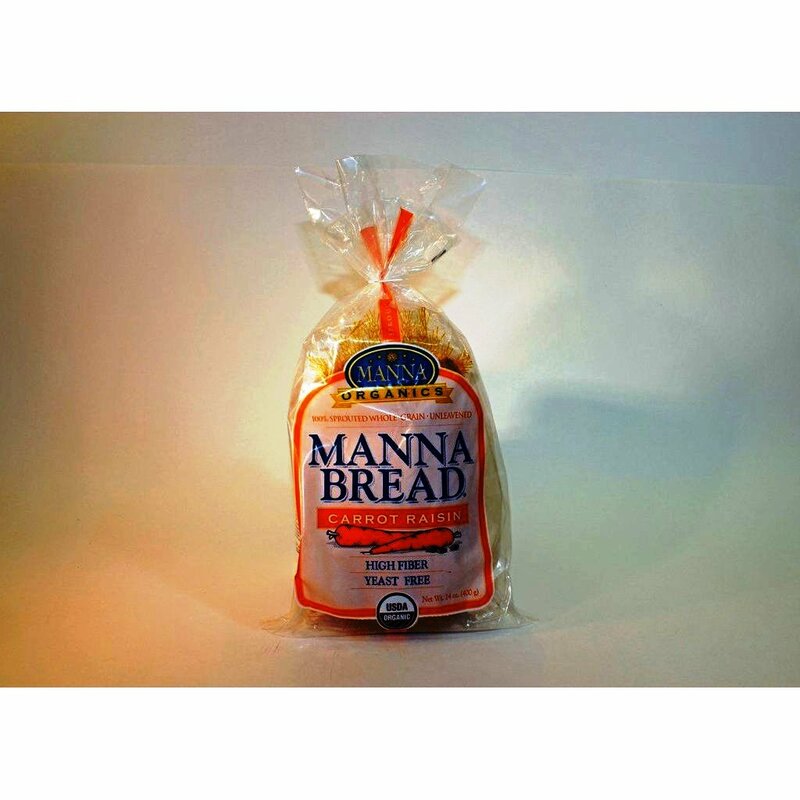 Manna Bread comes in several varieties. If you can’t find sprouted bread locally, Amazon sells it . Just click on this link: Manna Bread Carrot Raisin . Unleavened sprouted bread has a cake-like texture, and breaks apart easily. Instead of stacking two slices together, use one slice to prepare an open sandwich. Spread cream cheese, avocado, or bean spread over the slice. Top the open sandwich with grated cheese, alfalfa or radish sprouts, a slice of tomato or onion. Here’s a recipe that you can use to spread over a slice of sprouted bread. Mash chickpeas coarsely using a fork. The mixture should be lumpy, not smooth, but all the chickpeas should be broken up. Finely chop celery and dill pickle. Combine all ingredients in a bowl, adding more mayonnaise or seasoning as needed. Store covered in the refrigerator. The spread will absorb moisture and firm up as it chills. This recipe is from The Savvy Vegetarian website. For more recipes click the link. Posted on August 30, 2012, in Food, Recipes, Recommended Products and tagged healthy eating, sandwiches, sprouted unleavened bread, sprouts, vegan chickpea spread, whole grain sprouts. Bookmark the permalink. 1 Comment.